The 3-Way Holster is the ideal balance of firm protection and comfort. The 3-Way Holster provides complete concealment and convenience, this holster was designed with consideration to both the protection of your firearm and your skin. The 3-Way Holster is the ideal balance of firm protection and comfort. The 3-Way Holster provides complete concealment and convenience, this holster was designed with consideration to both the protection of your firearm and your skin. Right hand inside the waist band, can slide all the way to the Middle of the back for concealment or left hand Clip on the Belt for open carry. And the Left hand works the opposite: inside the waist band for left handers and Right Hand clip on the Belt for open carry. 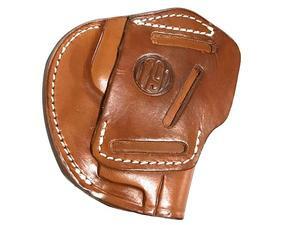 3-Way Holster made from Handcrafted, Premium American Heavy Native Steer. Top notch American steel clip for complete and safe retention. Open top for quick draw.